Confirmed by an employee as an all vegan restaurant, Water Lily also uses no onion nor garlic, and sells a small selection of store cupboard items (including vegan mayo, prawn crackers, and instant meals). It’s a popular place, especially at lunchtime when the city workers flock in, but they will always accommodate and answer any questions regardless. The staff are happy, the service is great, and the menu so extensive I can’t imagine anyone would be able to claim there’s nothing they can eat. Soya meat, fish, and prawn, along with tofu and vegetable dishes are a feature, but don’t forget to try a sticky bun on your way out! Basic vegetables and noodles in a not too salty gravy, the claypot made good comfort food as expected from nearly any dish of this style. 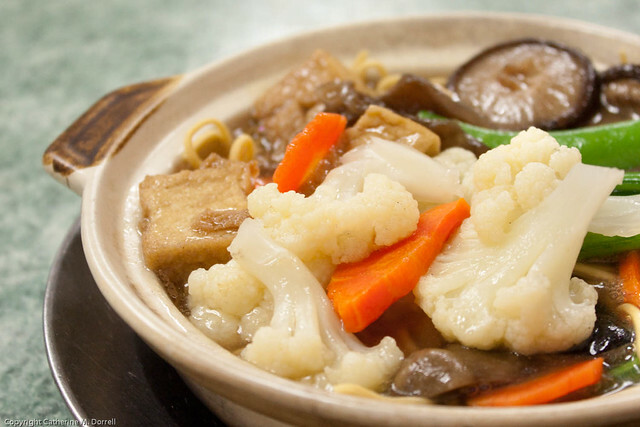 Ingredients included cualiflower, carrot, shiitakes and other mushrooms, tofu, and noodles. An extra splash of soy sauce and I was all over the mee. Marmite spare ribs (yes, really). Mind-blowing, as you can only imagine, I had no idea what to expect until the plate hit the table and the strong aroma of marmite began to rise up. The faux meat was even pink-ish in colour like pork, and sugar cane was used as the bone. The texture wasn’t at all rubbery as some faux meats can be, and using marmite on ribs might just be the best idea ever. I make an effort to try something new every time I return to a restaurant while I’m away, but I ordered these multiple times! 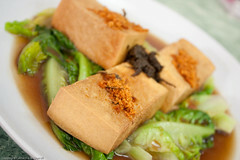 A very simple dish that won’t leave you hungry, massive chunks of tofu are deep fried and served on a bed of greens in a salty-sweet sesame broth. Veggie meat floss and what tastes like preserved vegetable in black bean are served on top of the tofu; the latter was the more flavourful ingredient. 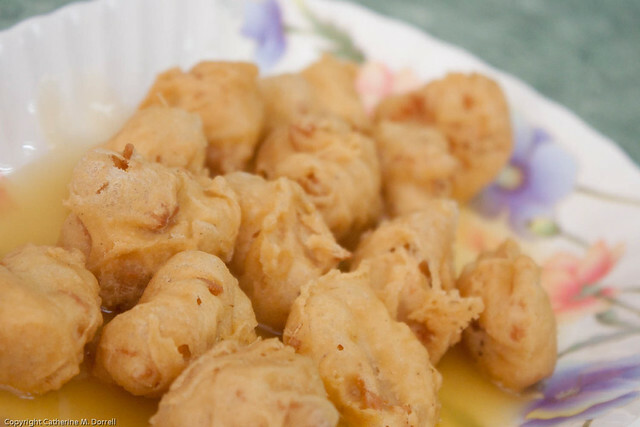 These texture-perfect light, crisp batter coated faux chicken pieces come smothered in a thick, sweet lemon sauce. They’re lighter than the ribs, softer, but equally moreish. 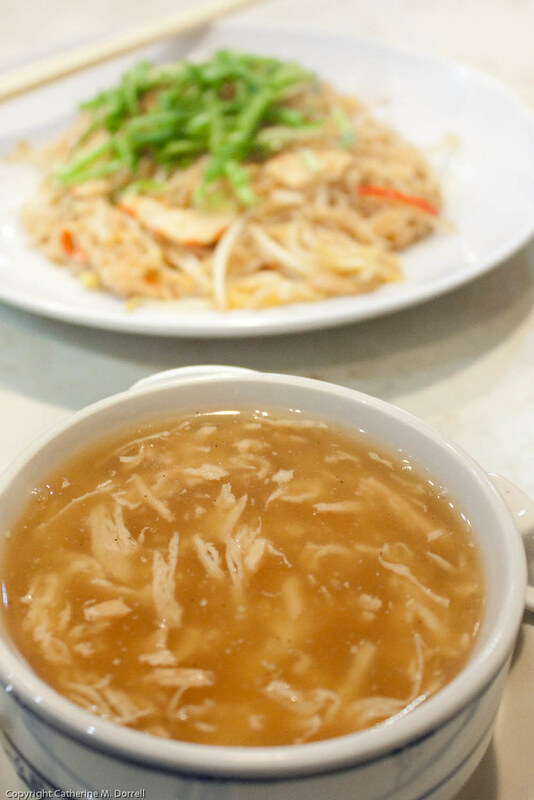 Fine shreds of faux ham constituted the shark fin replacement in this thick and moderately tangy soup. I sensed a tiny hint of sesame, but couldn’t peg the whole profile. All I know is it was brilliant. 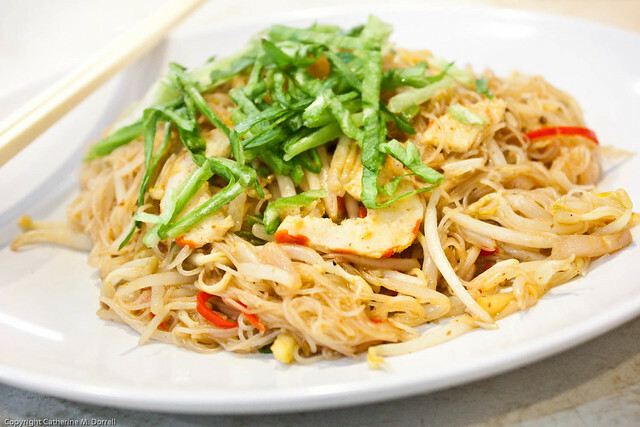 Normally served as a soup but adjusted since I was already having another soup, these thin, fried rice noodles with veggie prawns and sprouts made for a great afternoon snack. I even enjoyed the prawns, and I’m not usually a huge mock seafood fan. Pineapple and chilli slices were thrown in with the tom yam paste in the stir fry, with a strong lemongrass taste to take it up a few notches in flavour. The thing I most loved about Water Lily, even aside from the food, and what kept me going back repeatedly, was the interested staff. Enthusiasm is catchy, and when someone gets excited about the food they’re preparing and wants to show you their products, question your opinions, and discuss techniques, then I’m immediately interested right back. I generally don’t frequent a restaurant more than once or twice if I’m in a big city with an array of dining options, but I’d recommend this place over and over again. It’ll be my first stop next time I land in KL. Um… sorry, but… yuck. I _want_ my food to not look like dead animal bits. I don’t want to keep having to remind myself it’s (probably – at least they _said_ it was) vegan. Ugh. I was a vegetarian for 30+ years, and have been vegan for the past 8 months or so. I have a strong stomach – I can clean up cat puke, scoop litter boxes, and tend to injured animals. But there’s no way I could enjoy eating something that tried so hard to look like it came from animals. I mean… faux _bones_ for frack’s sake? Blargh. I’m grateful for anything that will get an omnivore to try a vegan alternative. 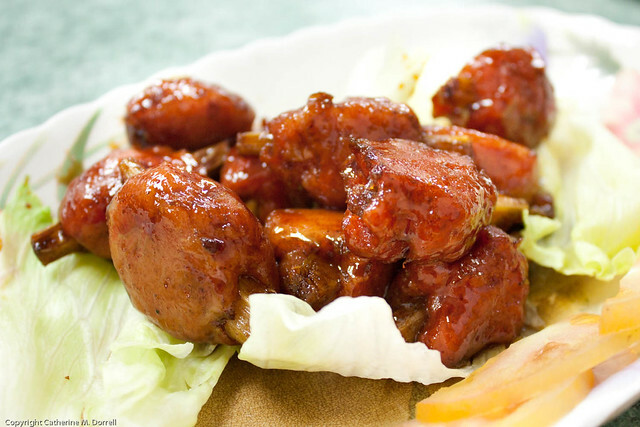 Being familiar with both vegan and vegetarian food, I can tell you that this is Chinese vegetarian food.